Mixed-grass prairie landscape at Bird Conservancy’s study site in western North Dakota. Photo by Kelsey Bell. Although it may not look it at first glance, the mixed-grass prairie of the Northern Great Plains is teeming with life. Warm-season native vegetation and intermediate rainfall characterize the mixed-grass prairie eco-region, which lies between the desert-like Shortgrass prairie to the west, and the fertile Tallgrass prairies to the east (now primarily converted to agriculture). The mixed-grass prairie occupies approximately 600,000 km2 of land reaching all the way from Oklahoma to Alberta, Canada. This may seem like a lot of space, but in reality, this figure represents only 30% of the prairie’s historic extent. 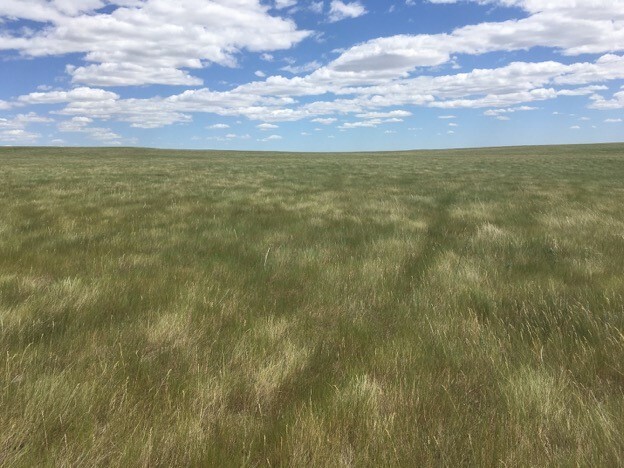 Grasslands are among the most endangered ecosystems on earth, and in North America, they have been converted and developed on a massive scale. Consequently, remaining mixed-grass prairie in the Northern Great Plains represents critical habitat for wildlife of all kinds, including our specialty at Bird Conservancy of the Rockies – birds! 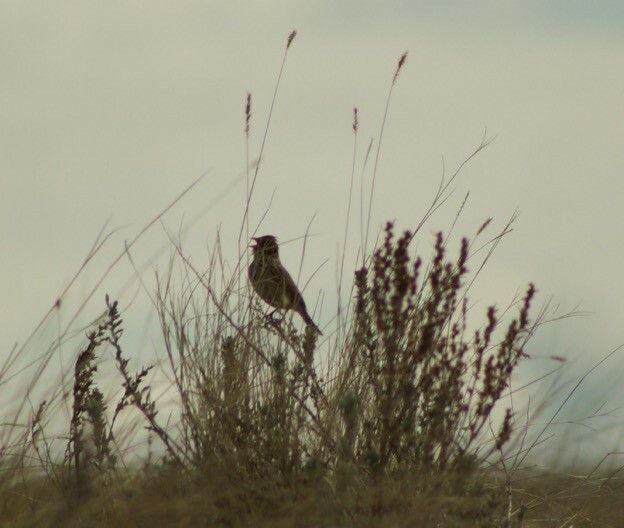 A number of specialized grassland songbirds, some of which breed exclusively within grasslands of the Northern Great Plains, depend on mixed-grass prairie habitat to survive. Sadly, these species are also among the most rapidly declining in North America. Steep declines are primarily a result of habitat loss and degradation across the migratory range, from Canada to Mexico, but where the greatest bottlenecks exist and what factors most limit their populations are largely unknown. With improved knowledge of limiting factors, targeted management and restoration of grasslands offer the best hope for these birds. That’s why, in 2015, Bird Conservancy established its Northern Great Plains Grassland Songbird Demography Project to complement our winter monitoring in the Chihuahuan Desert and provide a window into the full annual cycle population dynamics of grassland birds. 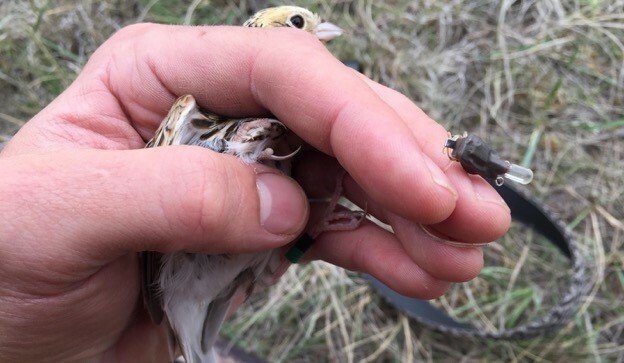 Through this effort we monitor the reproductive success and survival of grassland birds like Baird’s Sparrow, Grasshopper Sparrow, Chestnut-collared Longspur, Lark Bunting, and Sprague’s Pipit. Bird Conservancy monitors the health of these species’ populations at sites in North Dakota and Montana, and collaborates with partners at the University of Manitoba to collect similar data at sites in southern Alberta, Canada. To assess population vital rates, we locate and monitor nests, capture and radio-tag adult and fledging birds to track their survival, and survey habitat characteristics. The ultimate goal of the project is to get a complete view of the breeding cycle of these birds, so that we can determine when and where they encounter the greatest adversity, and hopefully, what management practices will help them. We have just begun the exciting third year of songbird monitoring here on the Northern Great Plains, and there are a couple of new developments this year. We are pleased to have three returning crew members from 2016 in leadership positions on the 2017 crew; Nicole Guido as crew leader in MT, Sasha Robinson as co-crew leader in MT, and Kelsey Bell as crew leader in ND. Nicole will also be starting her Master’s work on these grassland bird populations this fall at the University of Maine, co-advised by Dr. Kate Ruskin and Dr. Mo Correll. These returners bring great experience to the crew, and show how much fun it is to work with these amazing birds! Northern Great Plains Grassland Bird Crew Leads. Pictured from left to right: Nicole Guido, Sasha Robinson, and Kelsey Bell. 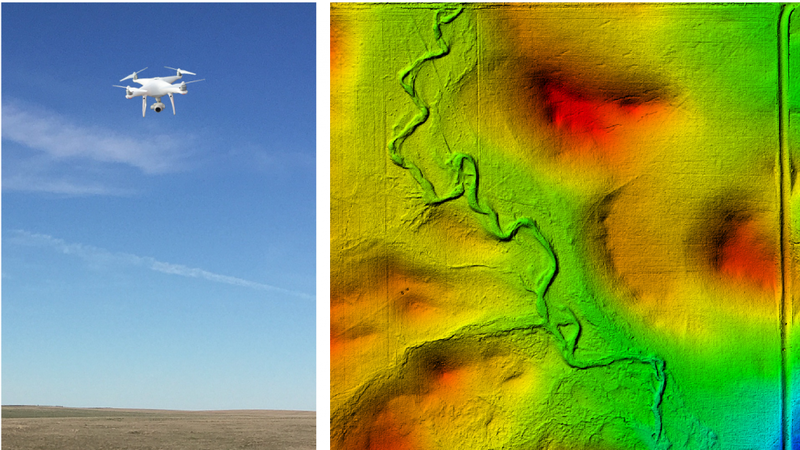 Additionally, we are piloting a new method of habitat data collection using Unmanned Aircraft Systems (UASs), or drones. Bird Conservancy donors provided much-needed support to purchase a Phantom 4 Pro quadcopter drone to collect images of our field sites from a bird’s eye view. Using specialized software these images can be combined to create high-resolution images, biomass estimates, and elevation models of our sites to help explore what habitat characteristics sparrows prefer. For migratory songbirds like Baird’s Sparrow, it’s not only what happens on the breeding grounds that matters, but also their wintering grounds in Mexico, and the long trip in between. To put together the last pieces of the puzzle, Bird Conservancy and our partners at the University of Manitoba, National Audubon Society, and the University of Oklahoma deployed almost 150 geolocator units on birds in the summer of 2016 to track their movements throughout their annual cycle of breeding, winter, and migration. These small backpack units track individual bird locations across the globe. This year we are working to recover these units and are happy to report we have already recovered three geolocators from Baird’s Sparrows at our partner field sites in Canada! We are hopeful we will recover more backpacks from these birds in the coming weeks to see where they went after they departed from the breeding grounds last year. Further, Bird Conservancy’s own International Biologist, Erin Strasser, continues to monitor adult survival for these species where they winter in central Mexico. Ultimately, we aim to combine our datasets through an Integrated Population Model to get a truly complete look at the life cycles of these birds, pioneering a full annual cycle approach to bird conservation.